5 Fab February 2019 Game Releases About To Destroy Your Wallet – Which Should You Buy? What makes it worse… all the big February video game releases are out within a few days of each other. Be prepared to have no time to work, study or even sleep! Because of that and the fact most people will only be picking up one or two of these games on release day. We thought it a good idea to guide you through the games and see which one is right for you. Check it out below, then leave a comment which one(s) you’re getting. On mobile? View as One Page Here. We Crackdown fans have been waiting a long time for this one from Sumo Digital. The guys have been using that time to make the game as full of action and fun as possible of course. But I’m really ready to play this now. This is one for the fan of open-world sandbox games full of things to do. Rather over the top things at that too. It’s all about powering up your agent and getting the ability to jump higher, blow up more stuff and (somehow!) be a hero for doing it. With multiplayer madness in there too, along with numerous agents to play and develop. Crackdown 3 looks like it’s going to offer some serious amounts of content too. Should you buy Crackdown 3? Xbox owners have access to one of the best services ever to hit gaming in the Xbox Game Pass. A gaming Netflix subscription that gives us all access to a lot of great games. With Crackdown 3 available on this service it’s the perfect time to pick up the pass. Maybe even on a discount if you shop around! Doing that gets you full to the game on launch day, which, in a busy month, will not actually fell as big an outlay as the full price game. There is little to lose here too, even if you are not a fan of the game. There’s still loads more to enjoy! Fans may well want to buy the game outright but I personally think you’ll be better with the Game Pass option. The events at the end of Far Cry 5 were what you expect now in the Far Cry experience. I don’t want to spoil anything if you have not played it, but if you experienced 4 and the twists and turns with Min. Far Cry 5 is similar and one of the great games of 2018. 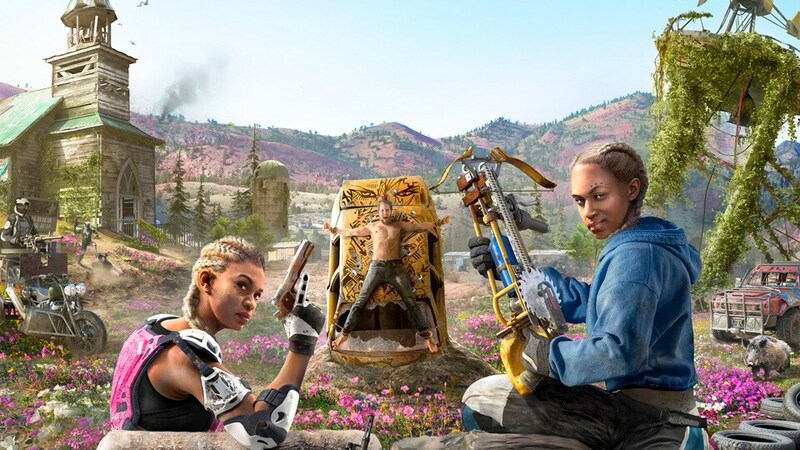 Far Cry New Dawn looks to pick things up after the events at the end of the previous game. Things are not much better in the world and you are going to have to put up a fight against some rather mean twins. With a beautiful open world to explore and tonnes of action to take on, it’s going to be another fun experience for series fans. Should you buy Far Cry New Dawn? Fans of the series this is 100% for you, and mainly for those who are wanting additional closure following Far Cry 5’s dramatic ending. Not played it? You have 15 days to bash though it before New Dawn releases so I would recommend doing that first. If you don’t have time, maybe leave this one until there is a cheaper package for the two together. It really does seem like a follow on from events you just won’t know otherwise. As a fan of the series, I will be picking it up of course. If you are the same as me in your love for Far Cry games, you won’t go wrong I don’t think! Get ready Manga fans! Jump Force joins the party in February. You guessed it, another title hitting the 15th. This one is a must for fans of all things Anime and Manga though given the huge character list and unique setting. The real world will be colliding with the jump world in this title. One that’s full of action combat and amazing effects. Our man David Game is a huge fan of this title. Having gone hands on with it late last year, going in with some doubts, after a few minutes he was sold on his experience. Should you buy Jump Force? I can’t claim to be a expert on these universes unfortunately. And I think in that point lays the answer to this question on Jump Force. It’s one for the fans to really get their teeth into. Outsiders like me might get some serious fun out of the gameplay don’t get me wrong. The title looks like it’s a lot of fun to take on. But I feel there’s a big target audience for Jump Force, and if you are in it, it looks like one to 100% add to your collection. Next up we have arguably the biggest development team involved in this one. Bioware go out with their latest game, more on the action side than RPG but the main focus here is the online part! The demo may have shown a few things the game needs to improve on. Particularly how the servers are going to work, but all the better this happens in a demo! The game itself is a blast to play. Zooming around the world both alone and with friends is incredibly enjoyable. All the exo-suit choices and customisation options are looking good too. That’s before we get to the story arc here and the sheer depth of the massive world to enjoy. This looks a big hit for those who love some action, looting and shooting mixed with some RPG elements. I am personally a big Bioware fan. A lover of all things Dragon Age and Mass Effect… well, until Andromeda. But that being said, it wasn’t a bad game, just a rather unfinished one. Lessons seem to have been learned here, plus the full team and the return of Casey Hudson on the case mean this really could deliver on it’s promise. My only question on the game to advise you on would be the solo play element. Can you REALLY get the best out of this game if you don’t team up? At least some of the time. I can’t fully answer that question yet, which might mean it’s worth waiting to find out. Other than that, I think this could be one of the biggest releases of 2019. Given the nature of these games, however it releases it’s likely to get better too. Well, after 4 releases on the 15th of February, you get a whole week to complete them all. Then you need to think about the next big epic title coming up in Metro Exodus. A game I had the joy of playing last year at EGX and it really impressed me. While not as big perhaps as the Anthem team of developers and publishers. I think this has the potential to be a truly excellent shooter set in a brutal world. Emphasis here is on story, survival and enduring this hard open world. A game full of challenges and some really gritty scenes. Something I’m really looking forward to playing more of. Should you buy Metro Exodus? This is an interesting one. From what I played of Metro Exodus on a demo build in 2018 I was very impressed. I think the story and the world all look really impressive. I also get the feeling the harsh world and emphasis on survival and gathering resources might not suit all gamers. There is a focus on reality in the game, keeping weapons clean and keeping your character in good health. All things that make it different to all the other, more “lighter” gameplay styles on this list. If that jumps out at you as “that sounds like my thing” then going more real and gritty with a game makes Metro Exodus the one to pick up this February. It’s a big of a challenge this guide because all the games on this list look well worth picking up. While I do have some concerns over Crackdown 3, given that Microsoft aren’t going all out on the marketing right now even though its out soon. I really do hope the Xbox gets it’s next great exclusive that is not more Forza. With the gamepass factor though, it’s not really a concern so much as the others at a full cost purchase. Of the other 4 I think Anthem stands out the most to me. But, given Bioware’s pedigree, especially this main team that last developed a GOTY in Dragon Age Inquisition. This could be the big one if the only service works. Jump Force may be one for fans, but the gameplay looked excellent. And being so jammed full of anime favourite characters it may be hard to resist. Far Cry New Dawn will be more of the same in the best way. I don’t expect huge change in anything technically given its the same engine as last year. But great for us fans. Metro Exodus is the dark horse here. It could well end up being the highest rated of all the games on this list if the ideas and delivery all come together. But, to sign off with a self imposed torture of “if you could only get one which would you get” question. My answer to that would be Anthem, with Metro very close behind it. Now You Make The Call Gamers! Ok, it’s a mad month and it’s going to cost us money, time, jobs and maybe partners during this period. But don’t get this far and not let me know what YOU are getting. Get in those comments below and let me know which you are buying on the list. Or if you are just blowing all the cash and getting EVERYTHING. I want to know! Previous articleAnthem Javelin Classes Guide – Fans fancy Storm, but which one is for YOU?